John Person trading techniques using Candlestick Charts in conjunction with Pivot Point Analysis! John explains this professional traders tool that most floor traders and outside research analysts use to help predict highs and lows of market price moves. Using this combination of candlestick chart formations and the calculations from Pivot Point analysis his teaching approach will help you better tune your investing skills. John Person's presentation will reveal the formula used in the calculation as well as how to apply it for different time frames. 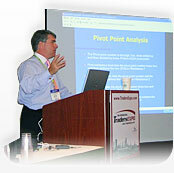 John system is also known as Person Pivots or PPS. John Person'strading techniques using Candlestick Charts in conjunction with Pivot Point Analysis! John explains this professional traders tool that most floor traders and outside research analysts use to help predict highs and lows of market price moves. Using this combination of candlestick chart formations and the calculations from Pivot Point analysis, his teaching approach will help you better tune your investing skills. John Person's presentation will reveal the formula used in the calculation as well as how to apply it for different time frames. 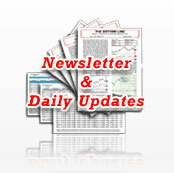 The Bottom-Line Newsletter is a publication written by John L. Person. The publication was a result of many request from clients and friends in the Futures Industry who followed John's daily recommendations on his daily Bottom Line Report hotline. 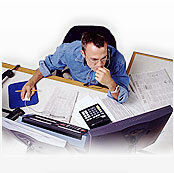 In 1998, John started to print his analysis as The Bottom Line Newsletter. Green arrows appear indicating a change in momentun that illustrate an entry or exit point. 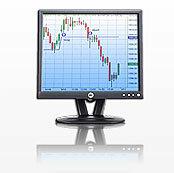 this is a great tool that will not only supplement other trading software, it may be the best trading tool used by individual traders today. Learn why using "Candles and Pivots" ™ can help you quickly identify trading opportunities by plotting changes in momentum. John's techniques can help you identify powerful and amazing turn signals. This is an independent investment research advisory entity - We are not affiliated with any brokerage firm or any other research company, this is John Person's website for investors and active traders! This site has evolved through the years as the demands and investment needs of individuals changed, one thing that has not changed is the volatility and the markets reflection of human behavior. The price changes, after all, are just a reflection of participants perceived value at a given time. That is why John Person looks at the key components of technical analysis to help him uncover certain clues as to what the market may do with a certain degree of probability. 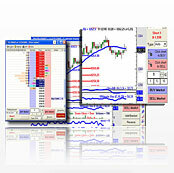 John Person's software indicators - PPS system - Designed for Forex Trading, Stock Trading and Futures Trading. These helpful indicators will help you calculate the projected Pivot Points Support and Resistance numbers based on a proprietary set of algorithms that incorporates the Pivot Point Averages as it relates to the close and Pivot Point value. I have been and continue to follow the advice in the Bottom Line recommendations. I am smiling all the way to the bank. Just a quick note to thank you once again for one of the best trading seminars I have EVER been to! It was a great seminar in Miami. A masterpiece of trading techniques and methodology. I have been in as many as ten of trading related seminars and I can say without any hesitation that yours is the best I've ever attended. I started with a $15,000 account and as of yesterdays close, my account now has a balance of $66,420 ( before commissions and option purchases)!!!!! I know that may seem like small peanuts, but to me it is truly AMAZING after only 3 and a half weeks in your chat room and never even having traded in futures before. Truly amazing to me!! John,.... 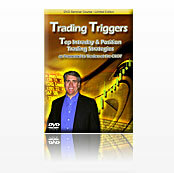 Thanks, having good success with the triggers since attending your seminar. Thanks for sharing of yourself and your knowledge.